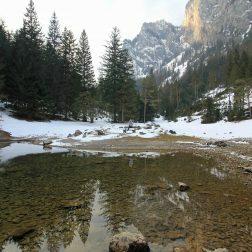 When the temperature rises and the ice is melting from the surrounding mountains, the lake gets filled up with water. 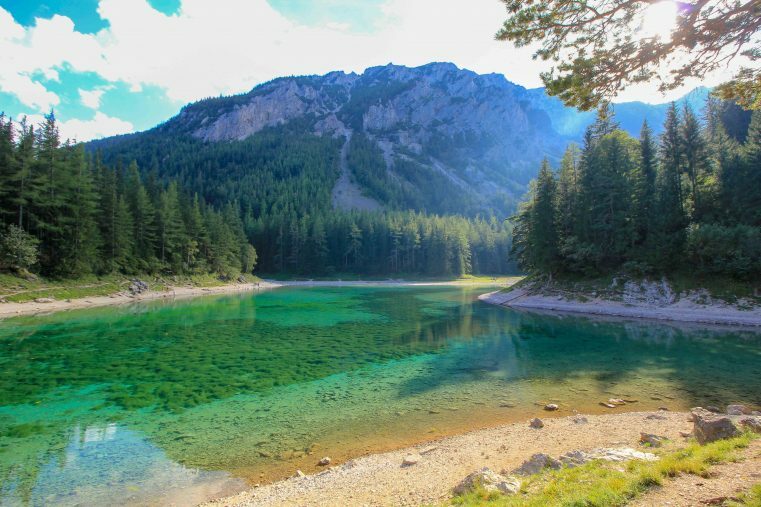 In this time of the year this lake is changing in a dramatically green/turquoise color and lots of visitors are coming to see this gorgeous beauty. 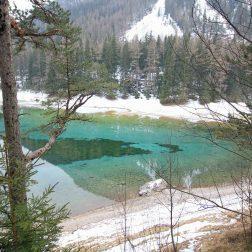 Moreover, the area is also called “the Caribbean of the Hochsteiermark”. Don`t forget to take a blanket with you, there are lots of beautiful places next to the lake which are inviting you to have a relaxing picnic! It’s also lovely to walk around the lake, from the parking lot the whole tour will take approximately 1 hour. 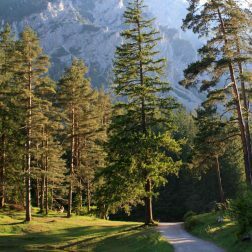 If you are up for some hiking, some great trails are starting from there too. 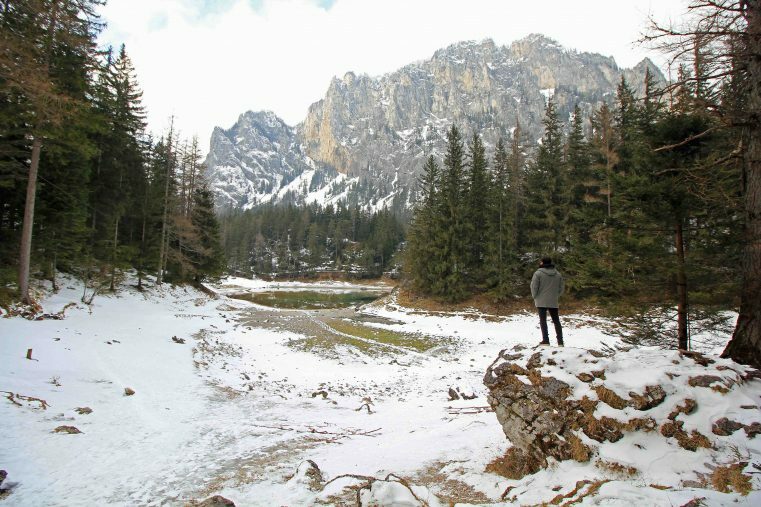 In winter this area becomes a small winter wonderland. 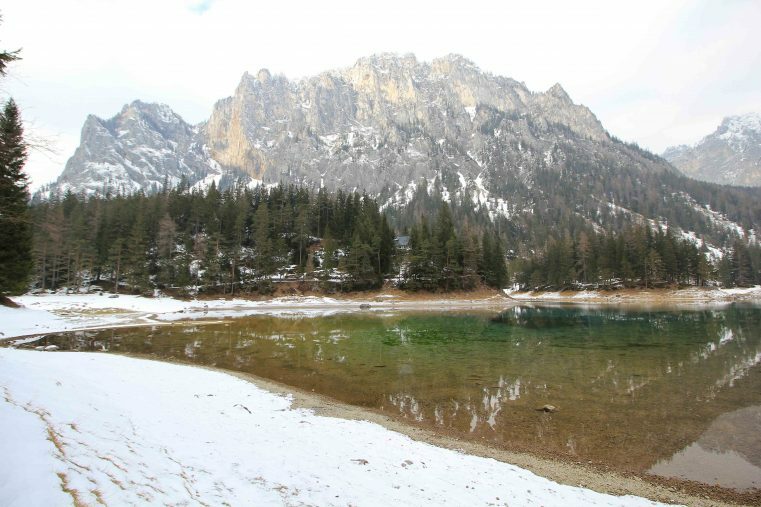 The winter perspective is totally different compared to the summer one, there is less water inside the lake and the area is really calm. 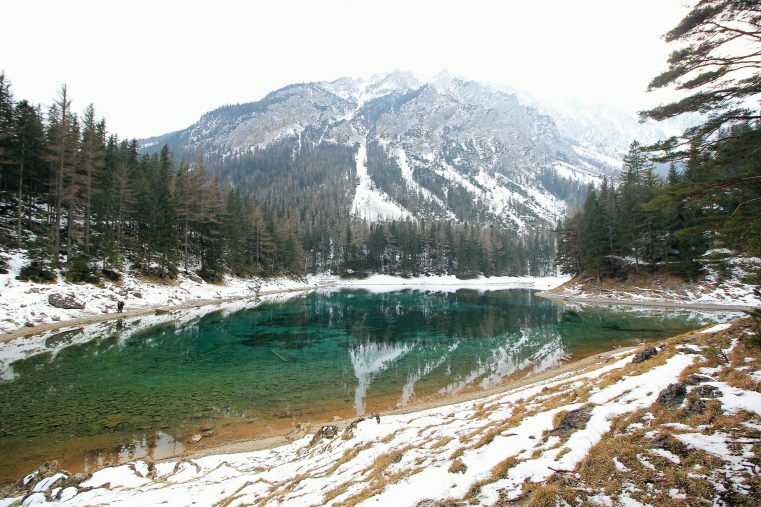 The lake appears as a mythic and crystal clear spot – the vibe is amazing there. If you are lucky you will even have the whole lake for yourself ;). Because of the low water level you can easily walk around the lake and enjoy the scenery. For the sportive ones: There is a beautiful cross country ski track starting just next to the parking spot. The route is about 14,5 km long with a wonderful panoramic scenery and you will skate next to the Kreuzteich. 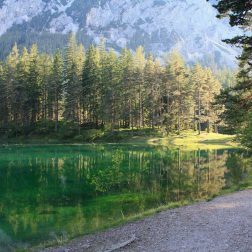 How to get to the Green Lake (Gruener See), Tragoess ? Parking is 4 Euro/day. The Entrance to the green lake is for free and there are no opening hours. Where to eat at the Green Lake? We recommend to eat at the “Gasthaus zur Post” inside the village of Tragoess. Traditional tasty Austrian kitchen with appropriate prices. In Tragoess you will find a few basic options to stay for the night. However, if you prefer a hotel you should definately check out the beautiful Falkensteiner Hotel in Leoben. Another possibility is to stay in the cities Bruck/Mur or Kapfenberg. Loved the blog. Green Lake is beautiful in both the seasons, but to me, I guess I would prefer the one in summer. It looks so beautiful and green. Loved the pictures in this blog. Wow – Green Lake looks so beautiful. I was in Austria many years ago, but did not visit this area. It truly is a winter wonderland! Wow, that’s a beautiful place and you really captured it with those amazing photos, great job! Wow, the lake is gorgeous whether in winter or summer. I cannot decide which season I would rather visit this place! Maybe summer though, I hate the cold even though it is beautiful. Btw, that yellow dress is super cute and fits right in with the lush green surroundings. I’m definitely sold on this gorgeous green lake! It’s great to read it’s free to visit too. Thanks for sharing this beautiful place! 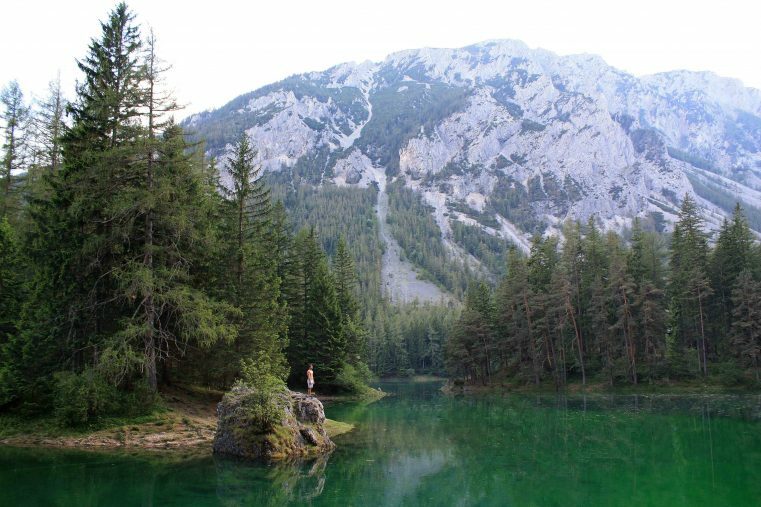 I love Austria and been there a few times but I have never heard of the Gruenersee before. The views from the lakeshore look amazing. Would love to check this place out and see what hiking trails lie nearby. 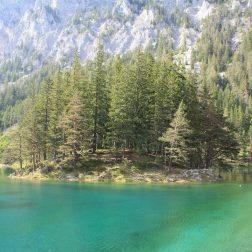 Oh man, glacial lakes – there’s nothing like them. Last time I saw lakes like this was in Banff 🙂 What a stunning set of photos!! Thanks for the amazing inspo. We’ve only seen Vienna, but clearly we’ve been missing out! 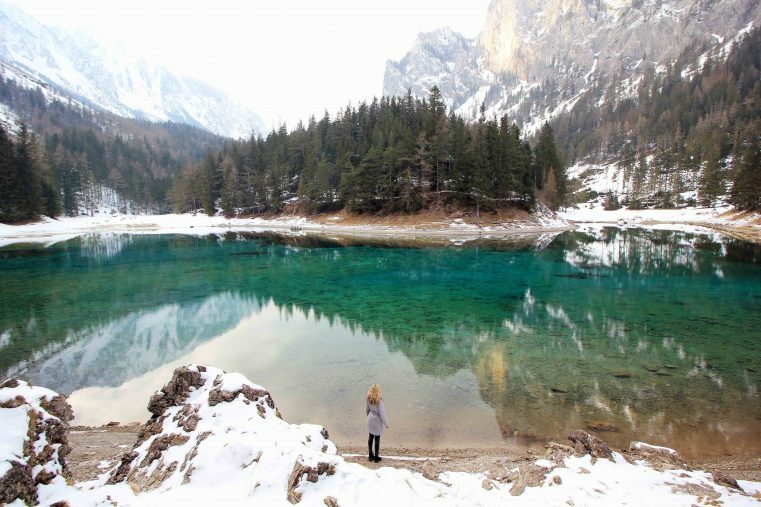 The Green Lake looks so beautiful in Winter, next year we might have to visit! Wow what a stunning lake! 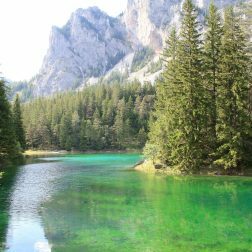 I visited Austria myself last year and found it to be a beautiful country – the mountains and lakes there are wonderful! I love the colours of this lake, you can see why it was named so! I love that it’s called the Caribbean of that area! Rightfully so with that crystal clear water! I did not have this lake on my radar but thanks to you, now I do! 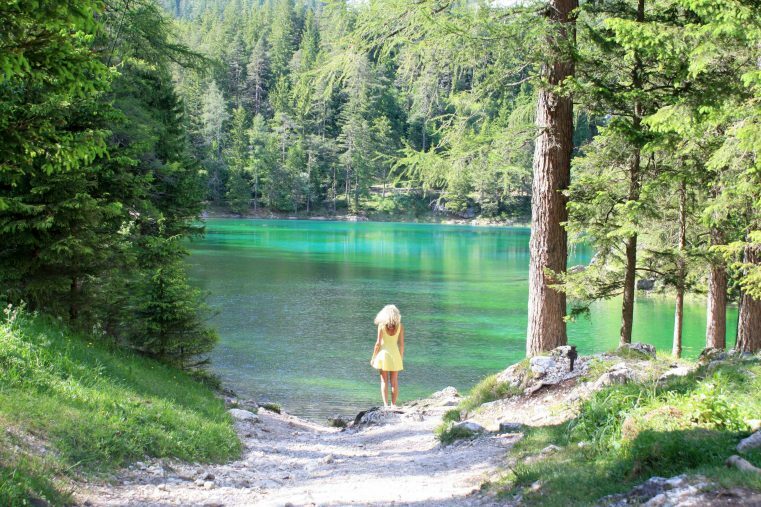 The Green Lake looks so mesmerizing. The beauty of the lake has a strange mystical quality to it. 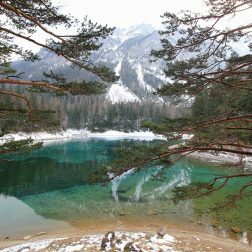 Your photos have brought alive the ethereal look of the lake in stunning detail What I am awed by is the way the lake assumes a different avatar in winter and summer. If it is beautiful in winter, it looks unbelievably stunning in summer. 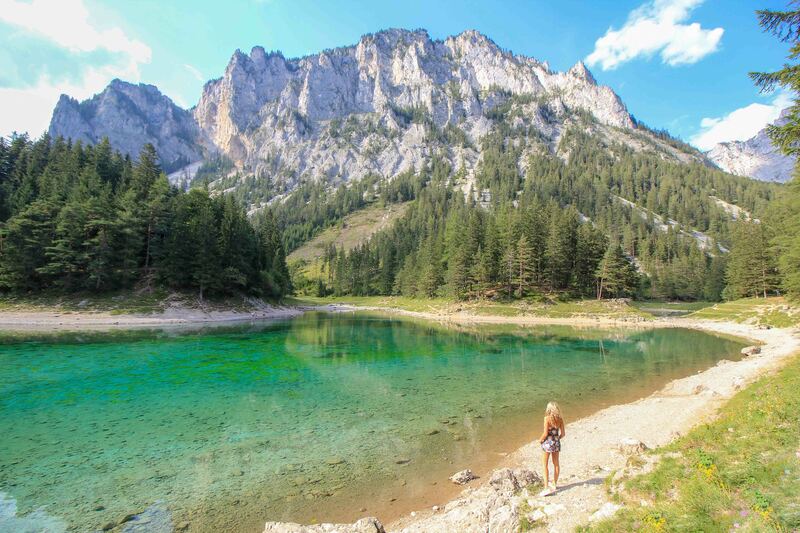 I’ve never even heard of Grüner See before but it looks like a stunning part of Austria. I’ve wanted to visit this gorgeous country again for ages now, I’ve only been to Vienna. Your photos are amazing, I especially love the one of you in the yellow dress!